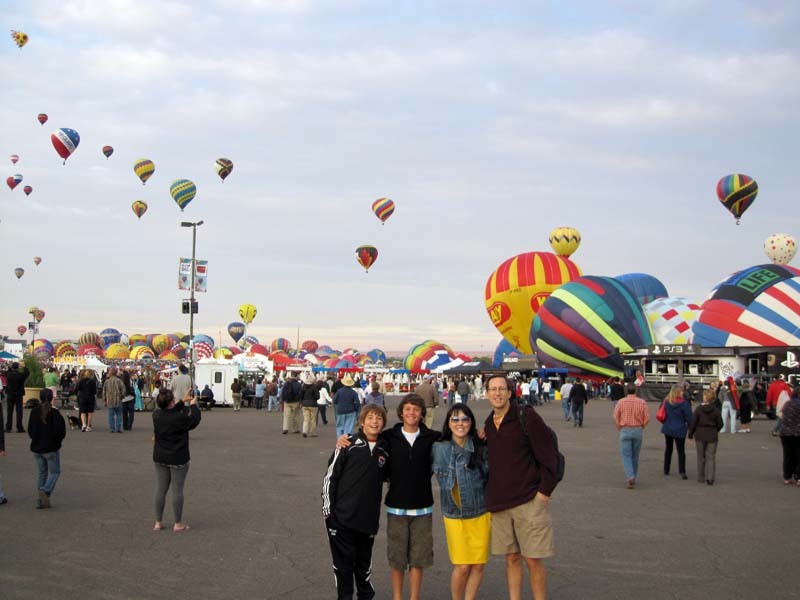 I went to the Albuquerque balloon fiesta on 10/2/2010 with my brother and some friends. On this webpage are some pictures and movies from that trip. Click on any picture below for an ENORMOUS higher quality original version. 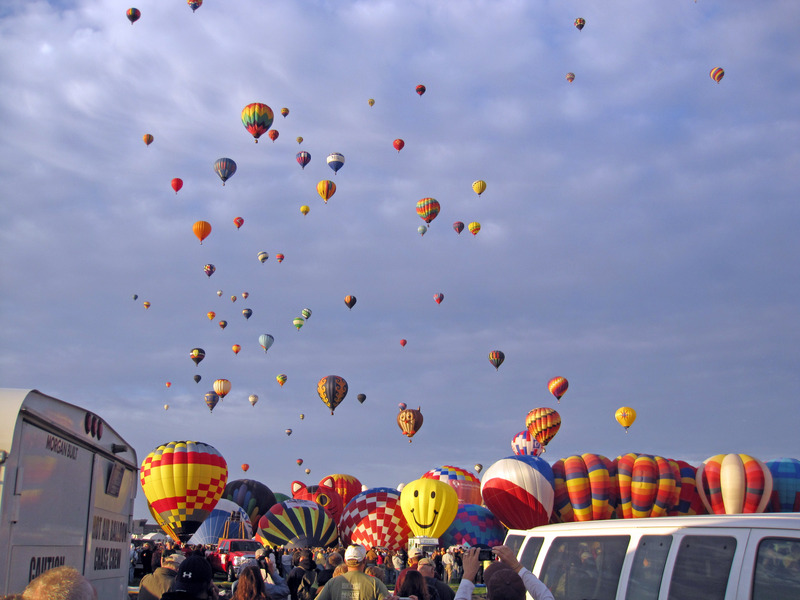 I also went to the 1997 Balloon Fiesta 13 years ago, Click here for pictures from the 1997 Balloon Fiesta. From left to right below that is Eli Echt-Wilson, Corey Miner, Katherine Chung, and Randy Wilson (my brother). 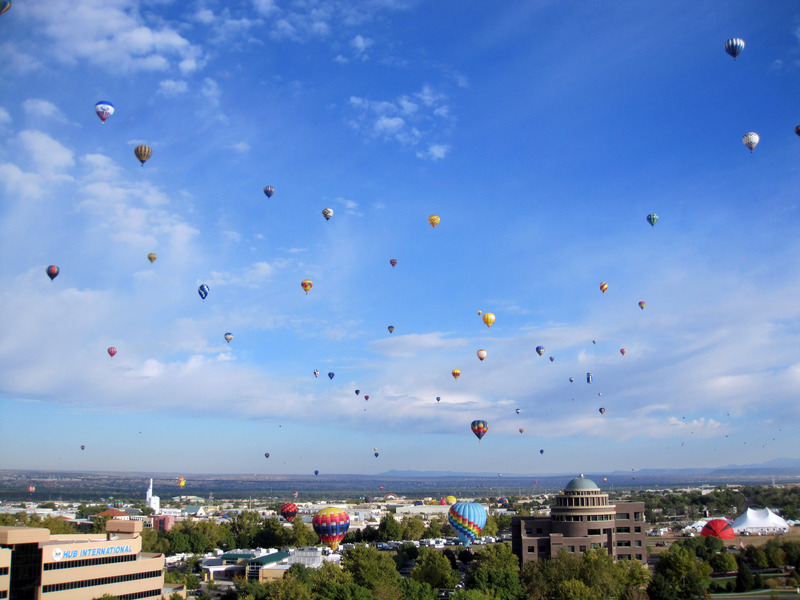 Eli, Corey, and Randy live in Albuquerque. Behind them is the "Balloon Mass Ascension" on Sunday morning. 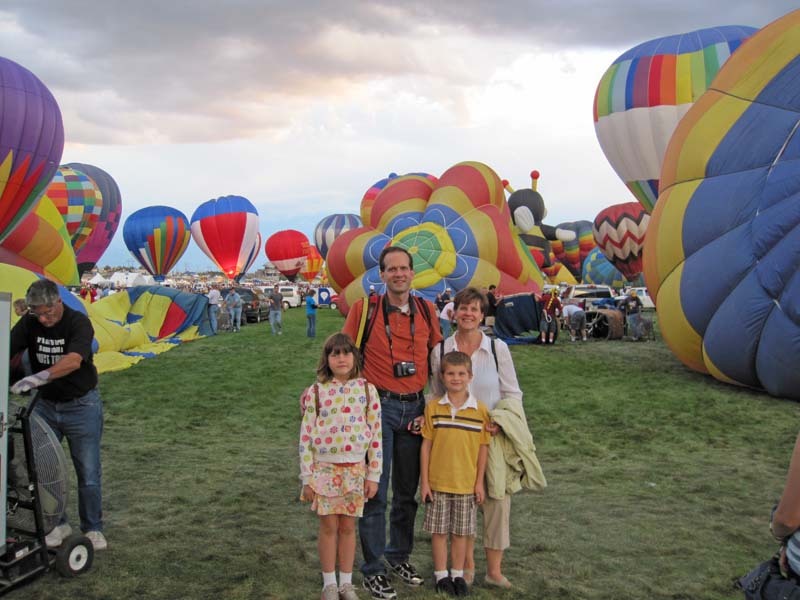 Below is why we are here, we can wander amongst the hot air balloons as they fire up and ascend into the air in the morning. 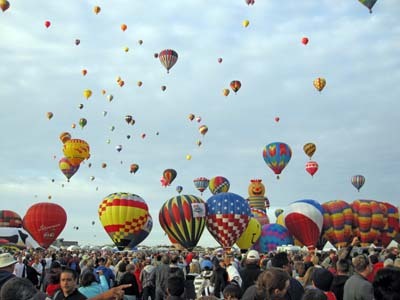 Below is a picture of the 2010 Albuquerque Balloon Fiesta Sunday Morning Mass Ascension. 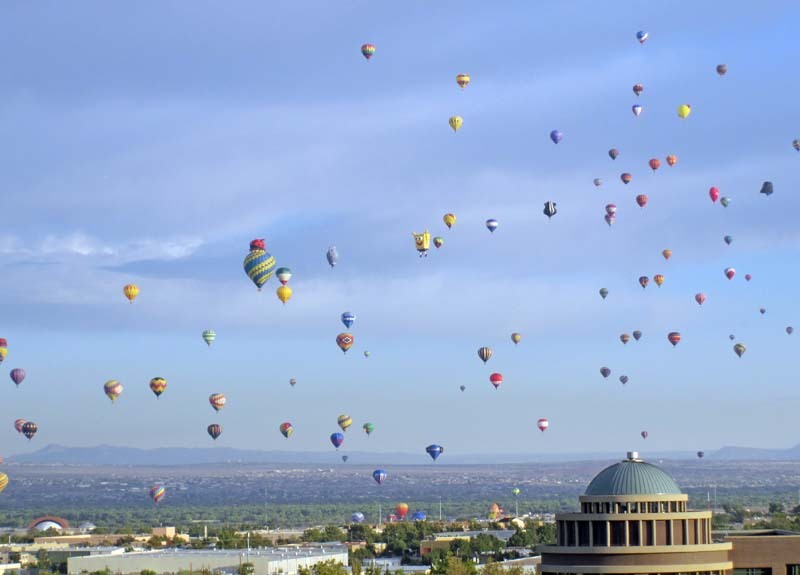 Hundreds of balloons floating in the sky, and more launching every minute. Ok, a quick explanation of what the heck is going on at the field level here. 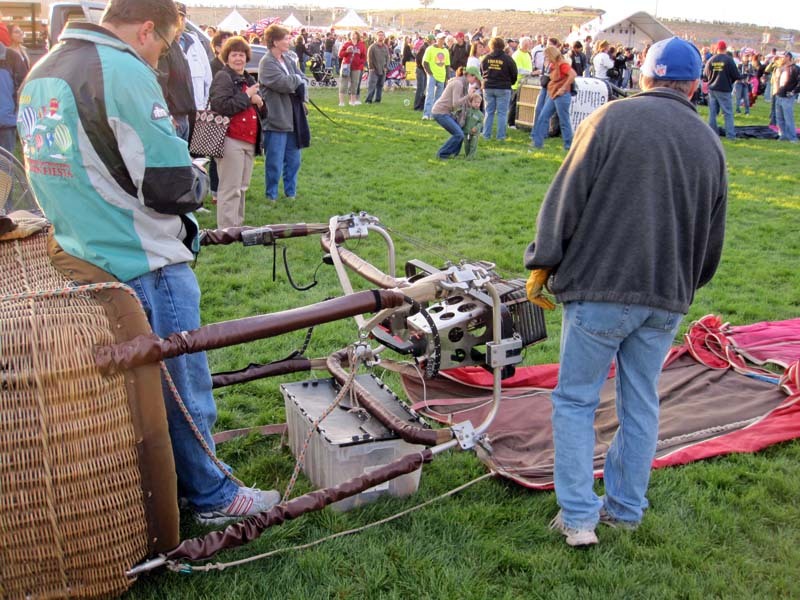 This is how a hot air balloon is launched. 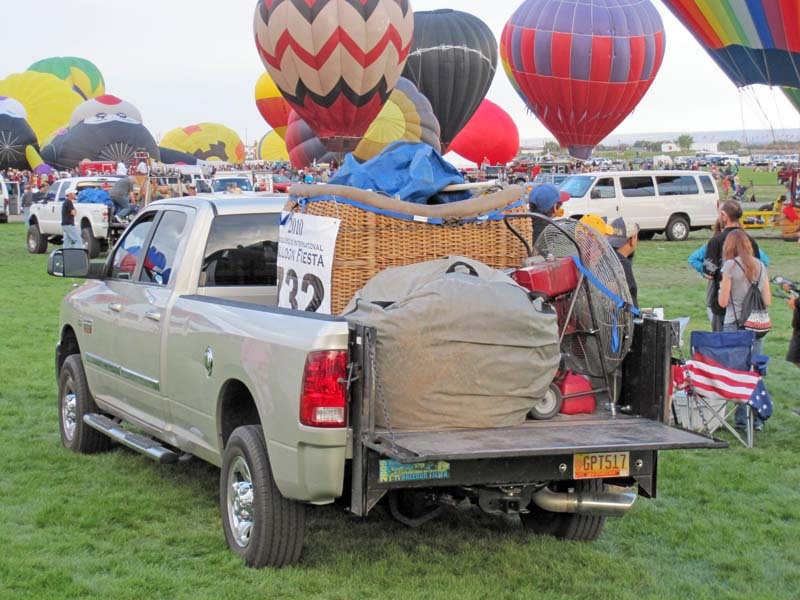 Below shows how the whole hot air balloon rig can be transported in a small pickup truck, and is driven out to the launch site (in this case the athletic fields in Albuquerque, New Mexico). 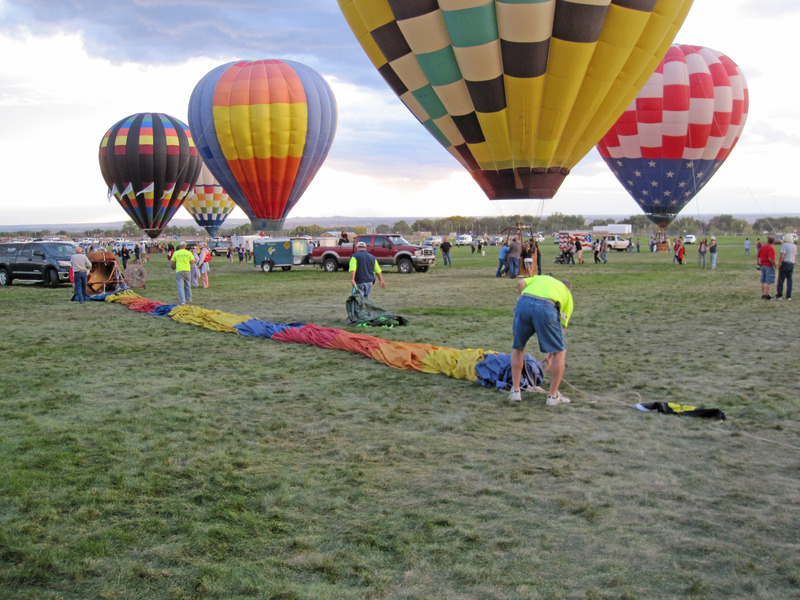 Next, the balloon owners roll out the balloon in an open spot. They need to prepare the ropes (lines) and the top vent. 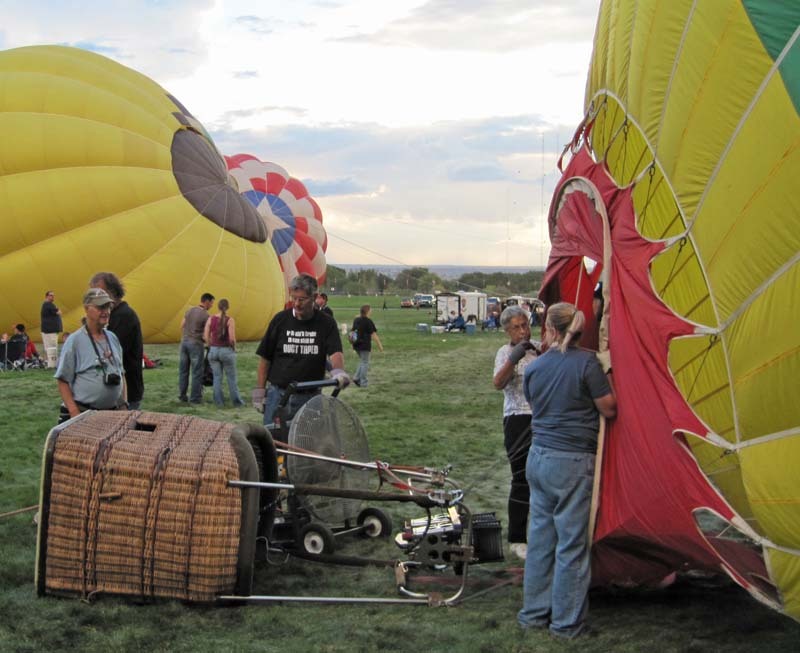 The basket and propane burners are laid on their sides at one end of the hot air balloon. 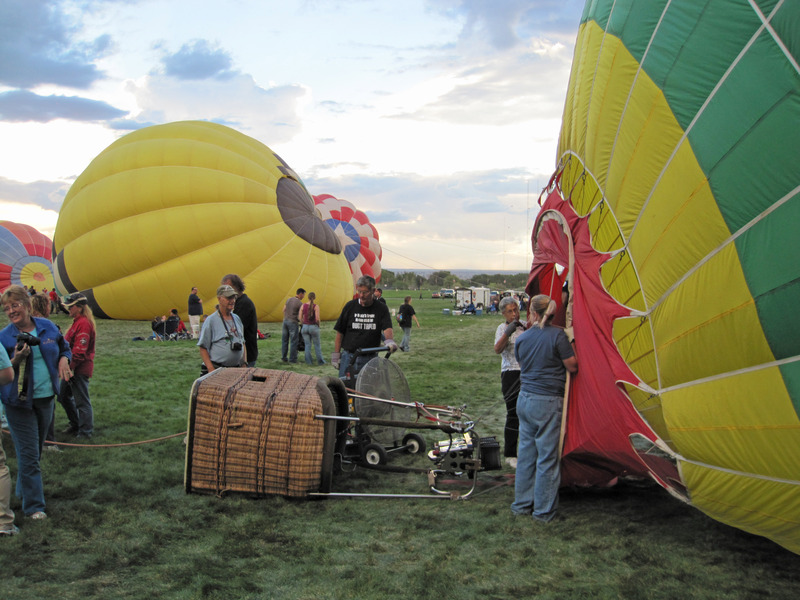 The first step of inflating a hot air balloon is take a big fan and blow COLD air into it to open it up as much as possible so when you use the propane burners it doesn't melt the balloon material. 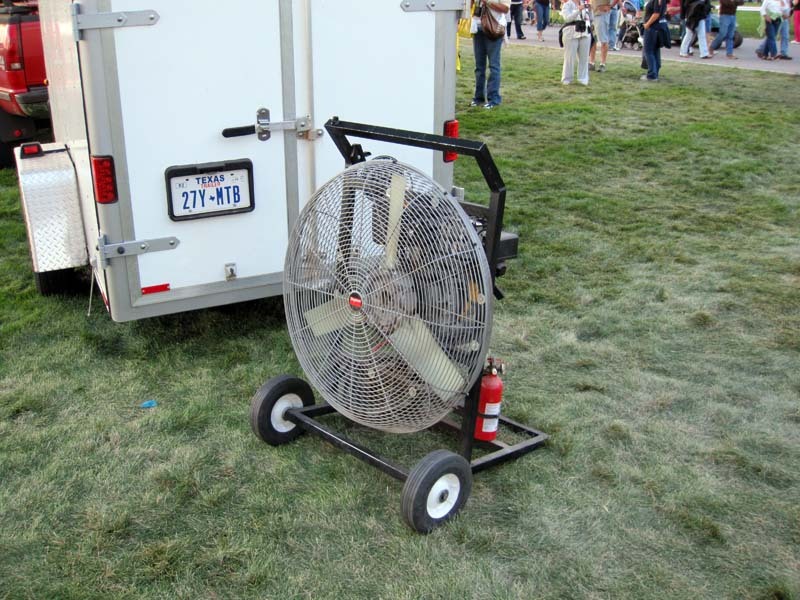 Below is a picture of one of these fans. 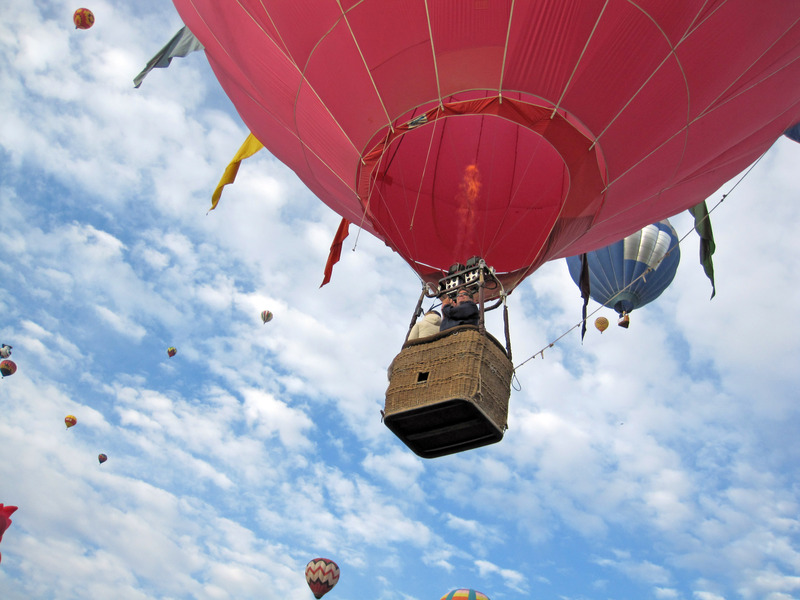 Below is a picture of a hot air balloon being inflated. They are using all cold air from the fan right now. 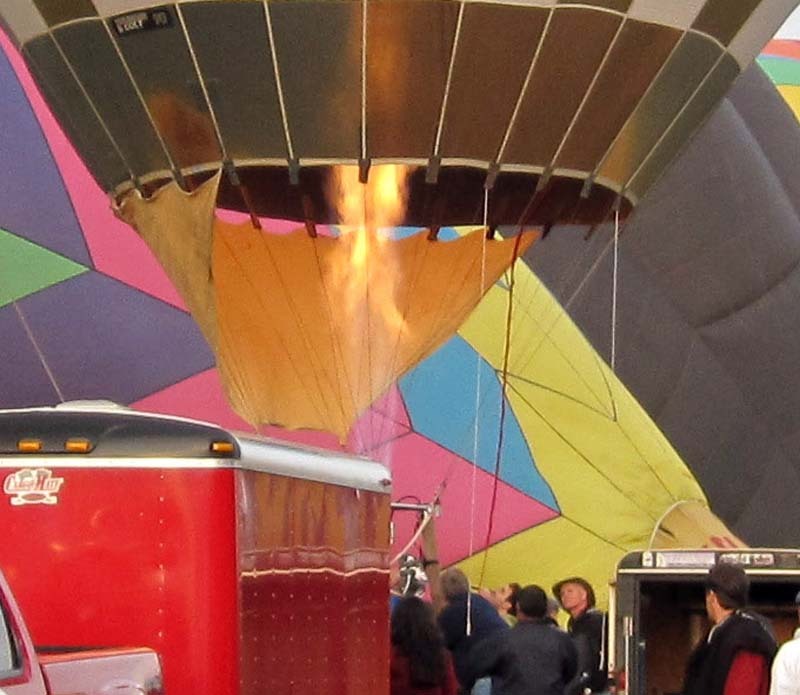 You can see the propane burners ready to shoot flame inside the balloon (the next step). 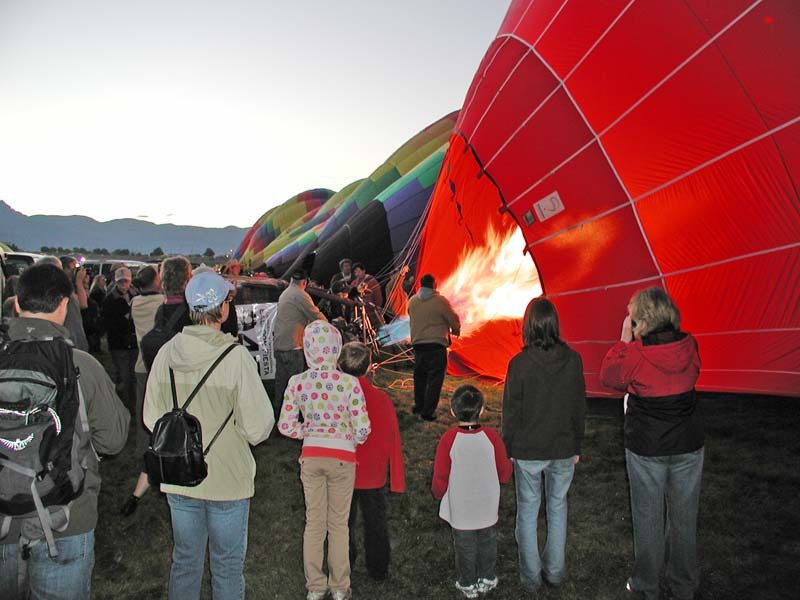 As the balloon becomes upright, below is a close up showing a flame being shot into the hot air balloon. People are holding the basket down on all sides, it is still getting ready for launch. 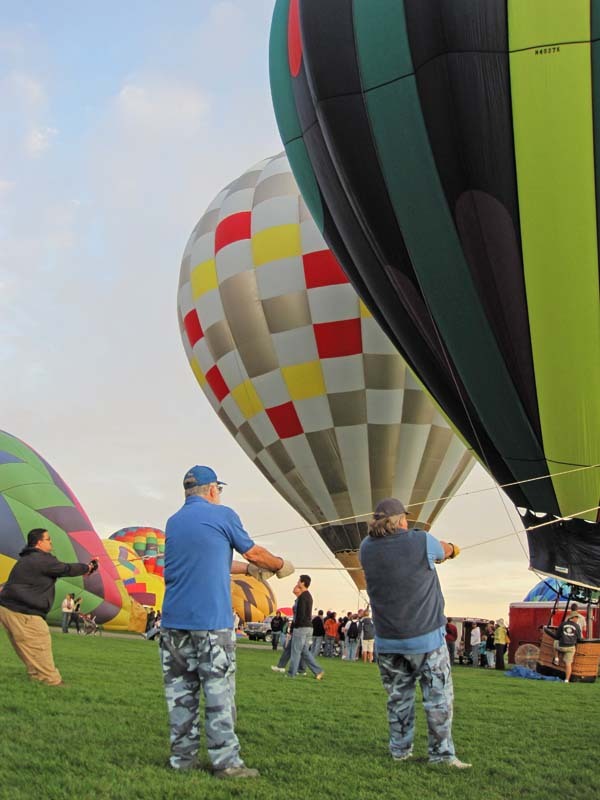 As the hot air balloon goes from lying on its side to vertical, a couple big guys hold ropes to keep it steady and from blowing away or getting tangled up. 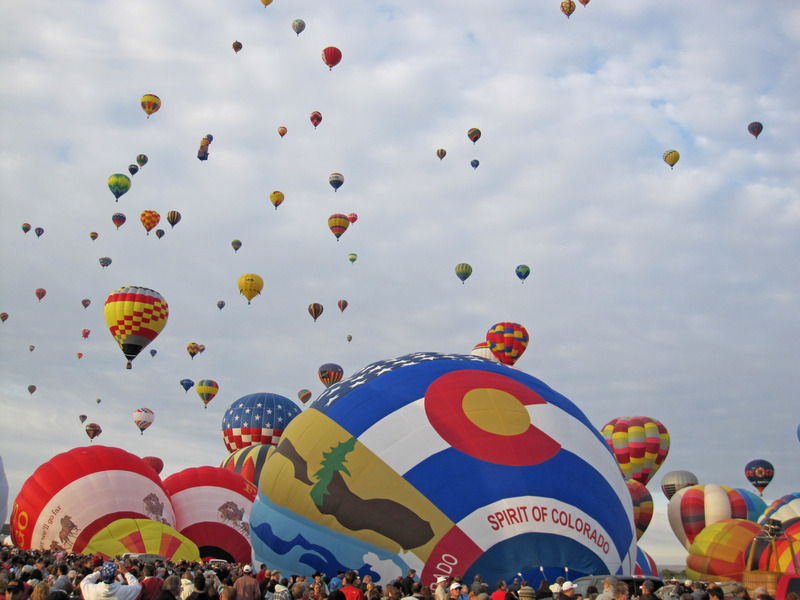 When it reaches buoyancy, the pilot fires up the propane jet and the whole hot air balloon rises up and floats away! Below you can see the pilot firing the jets as this balloon rises away from the field. 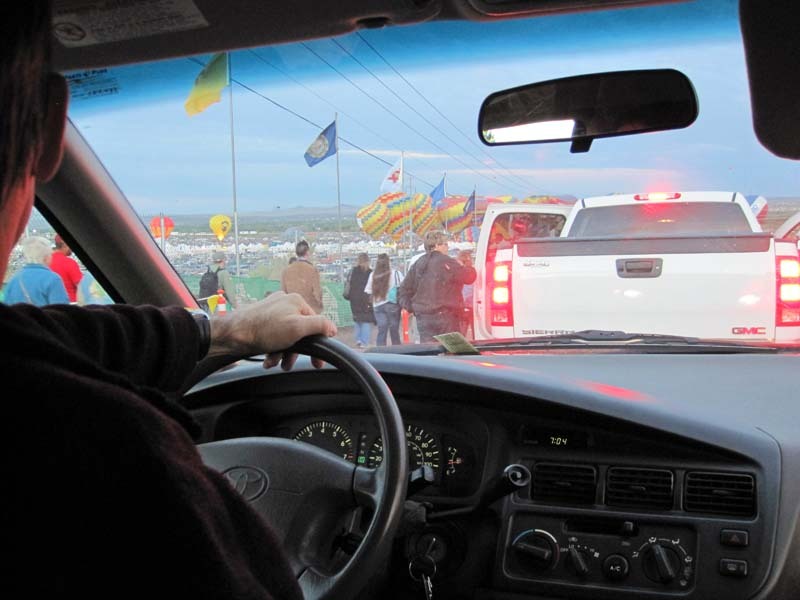 In the mornings, special (very experienced) balloon teams go up in the "Dawn Patrol" to check out weather conditions. It is very neat to see the "light bulbs" light up in the morning sky as the balloons fire up their propane burners to gain altitude. 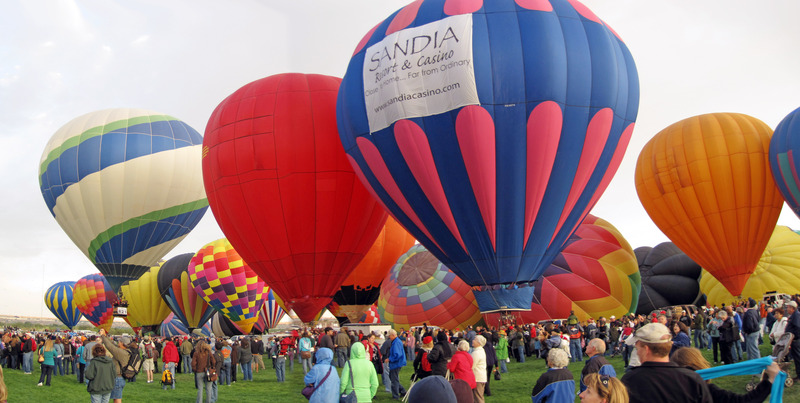 Below is a picture capturing a moment one of the balloons is firing their propane flame throwers. The picture below is taken from my hotel room window. 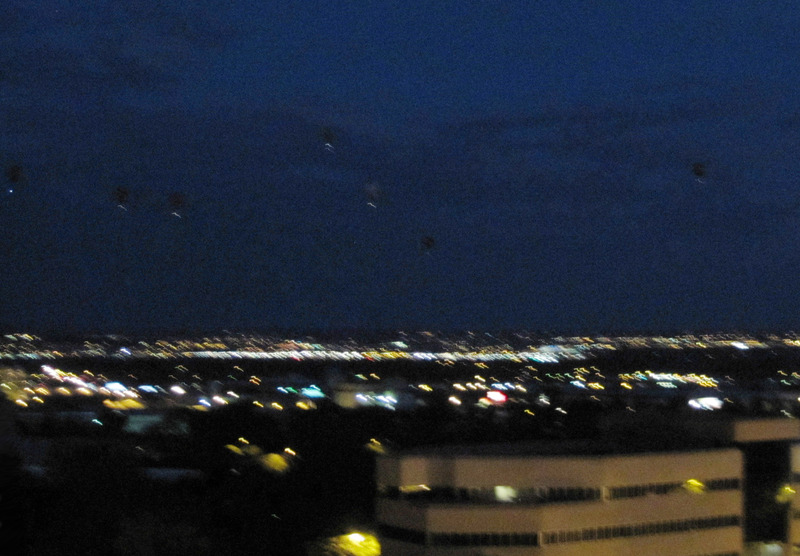 The picture below is brightened a bit to see the hot air balloons in the sky before sunrise. 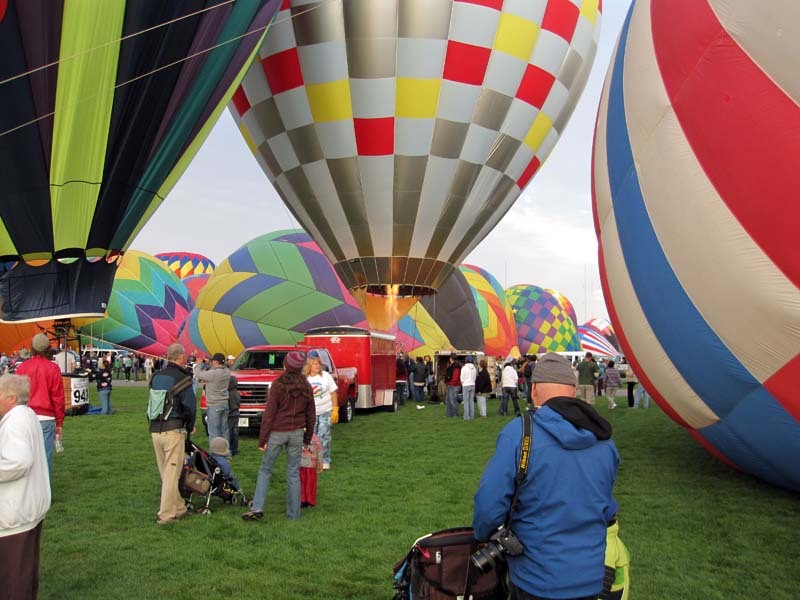 Wandering around amongst the balloons. It's total mayhem, balloons "kissing" each other here as they inflate and launch in the mass ascension. Below is a smiley face balloon. 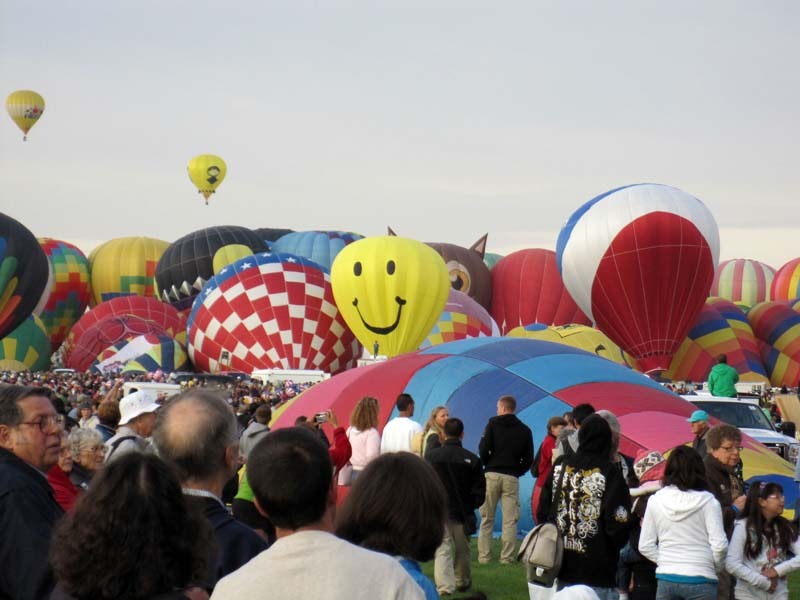 Below is an "Evil Clown Hot Air Balloon", and some others. 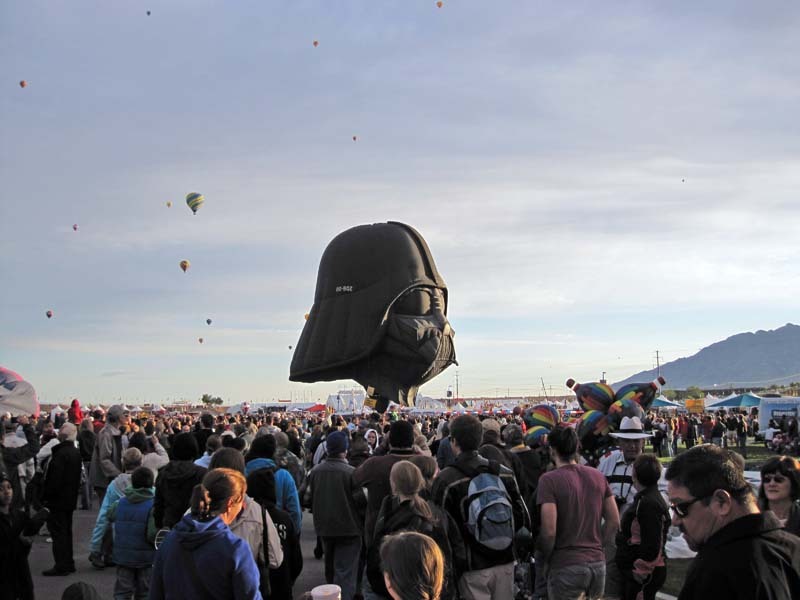 Hot air balloons can be many interesting shapes. These are sometimes called "Special Shapes". 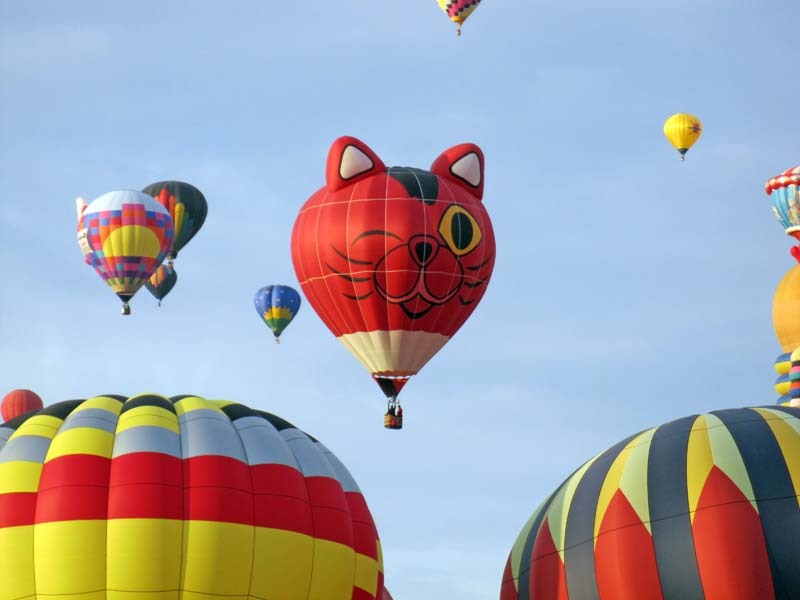 Below is a small modification on a standard hot air balloon, plus artwork to make it a winking kitty cat balloon. 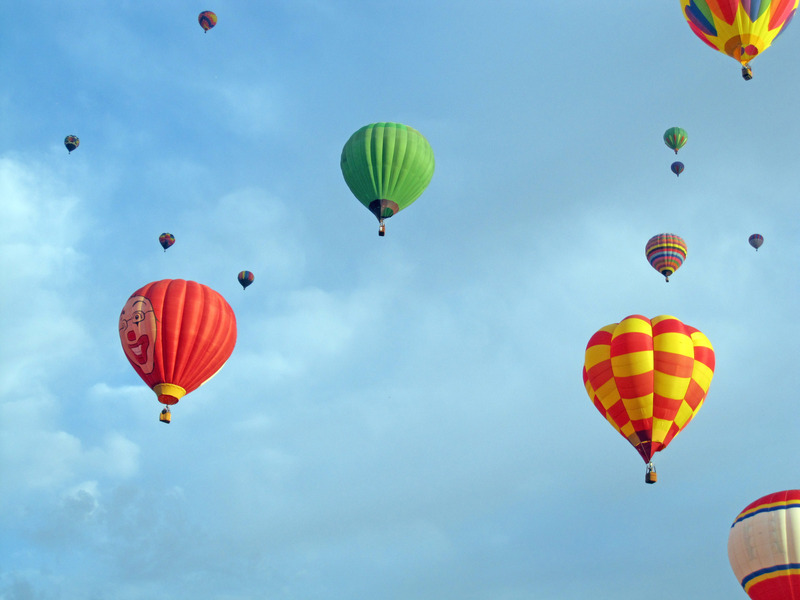 A bunch of hot air balloons in the air, plus a "special shape" kind of a red haired person hot air balloon. 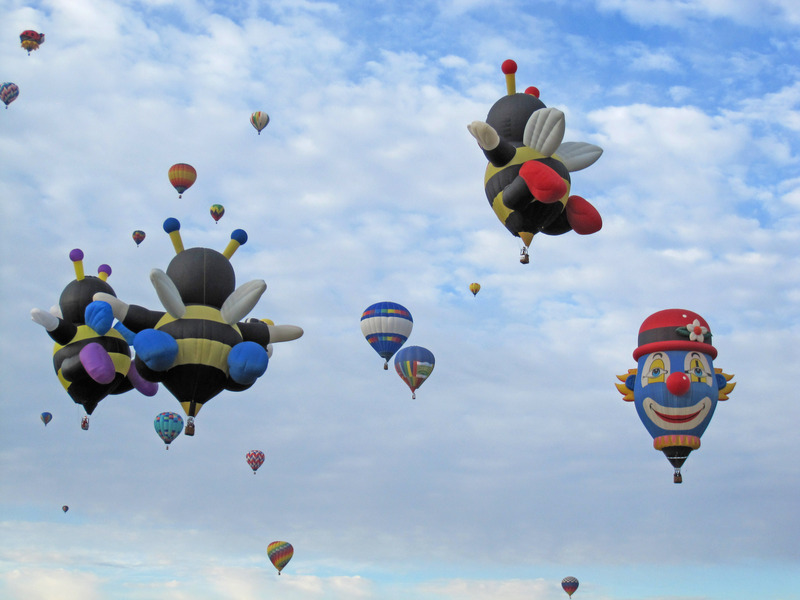 Three bumble bee hot air balloons took off holding hands, and there is also a blue clown hot air balloon. 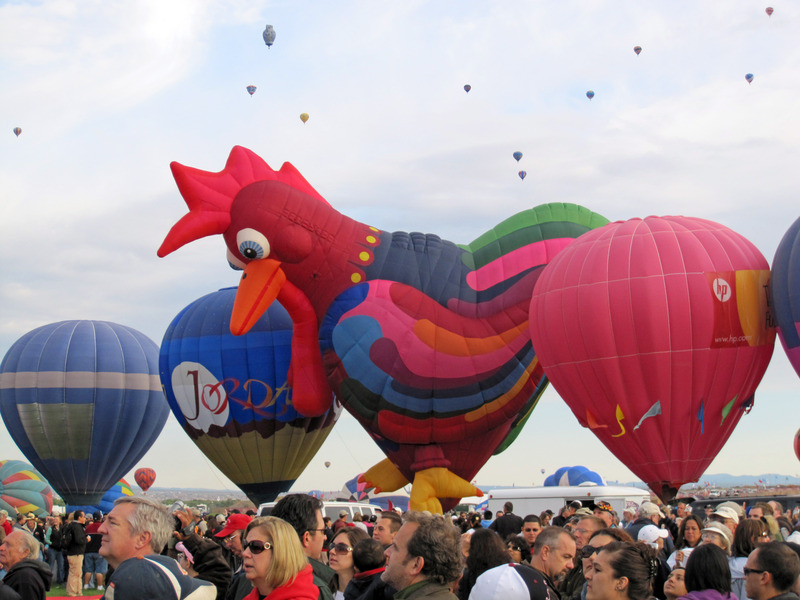 A rooster hot air balloon special shape, getting ready to launch. 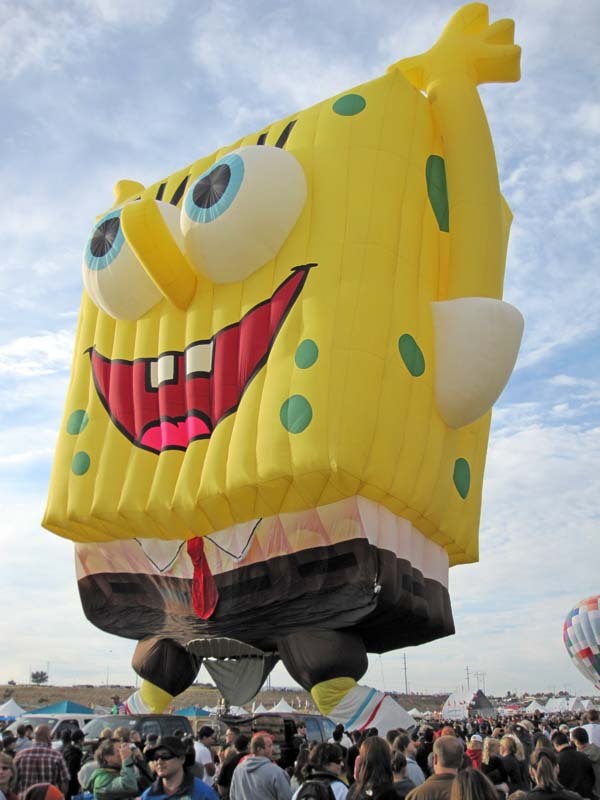 Sponge Bob Square Pants hot air balloon. 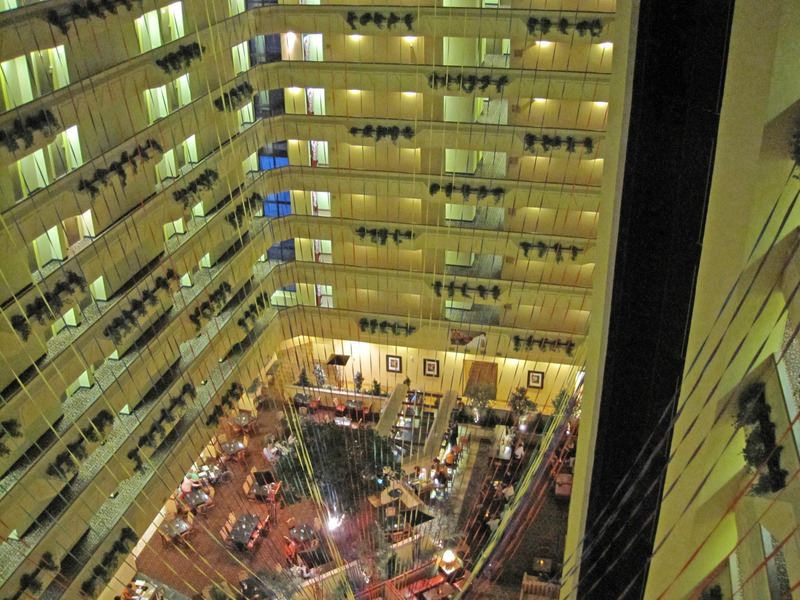 We stayed at the Albuquerque Marriott Pyramid North, the atrium is pictured below. 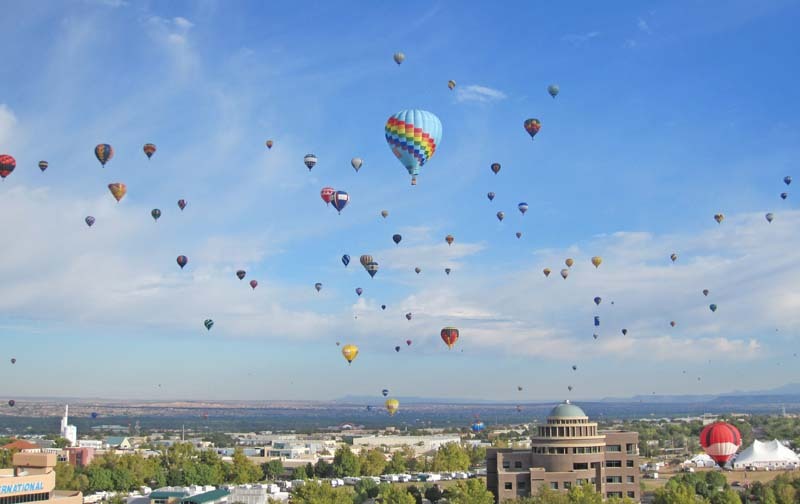 The hotel is "ok", but mainly it is the closest high rise hotel to the balloon launching grounds. I was in room 1008 on the 10th floor. 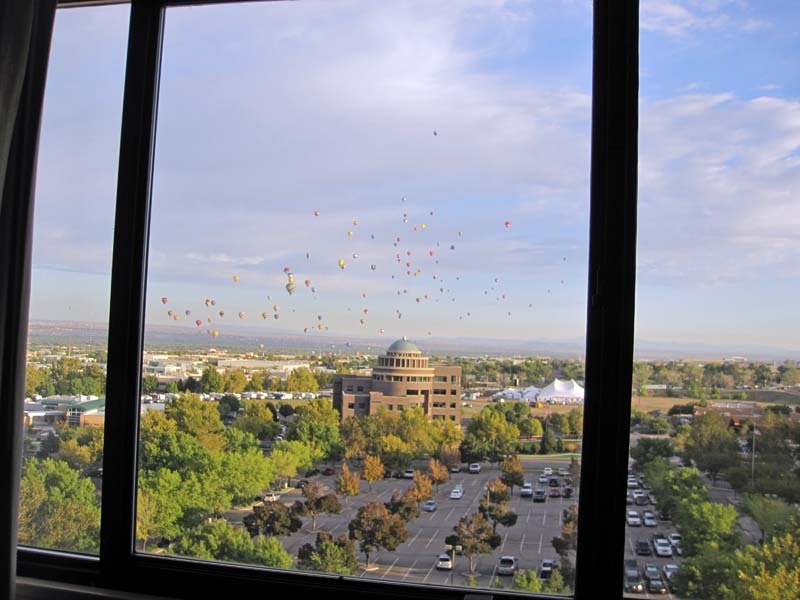 If you are in any rooms numbered xx06 - xx16 above the 2nd floor, you are facing the balloon fields and can see the balloons launch in the morning from your hotel window. If you are not in those specific rooms, there is no reason to be in this hotel as you won't see any balloons. 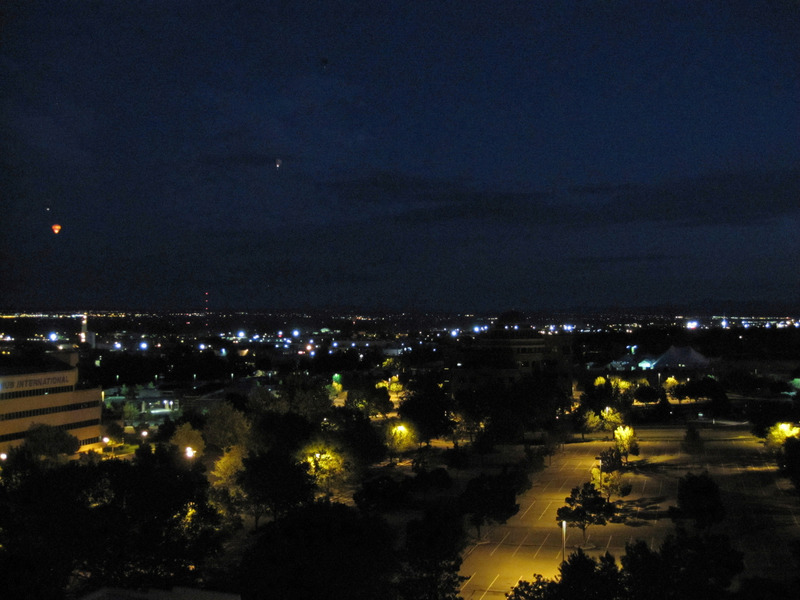 Below is a picture out my hotel room window on the 10th floor. Totally unrelated to the Balloon Fiesta, we visited old friend John and Nadine Miner and below is one of their kids Amanda (with me Brian). I offered Amanda $100 to drink a gallon of milk in an hour (the trick here is no human can do this without throwing up). We all decided Amanda was too small, but we wrote up a contract that she can do this in 2 years if she likes. 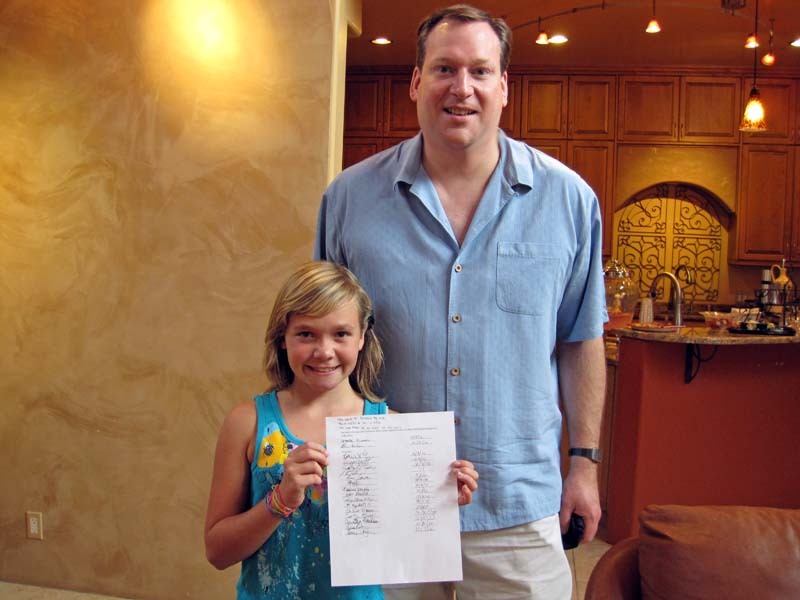 Click on the picture below if you want to read the contract, it says "If at any time in October 2012 Amanda Miner drinks a gallon of milk, Brian Wilson will give her $100." 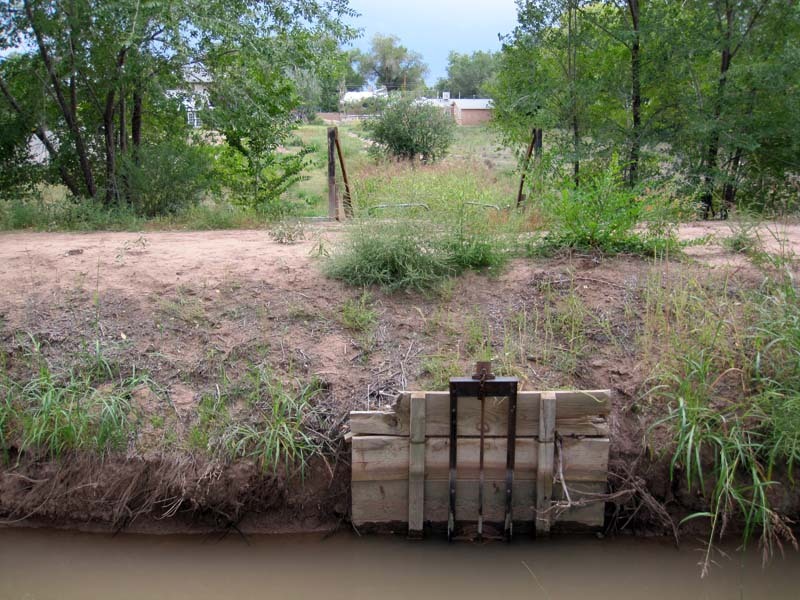 John and Nadine's property in Albuquerque, New Mexico can be irrigated through the 100 year old system of "Acequias" which are "Communal Irrigation Canals" pretty unique to New Mexico. 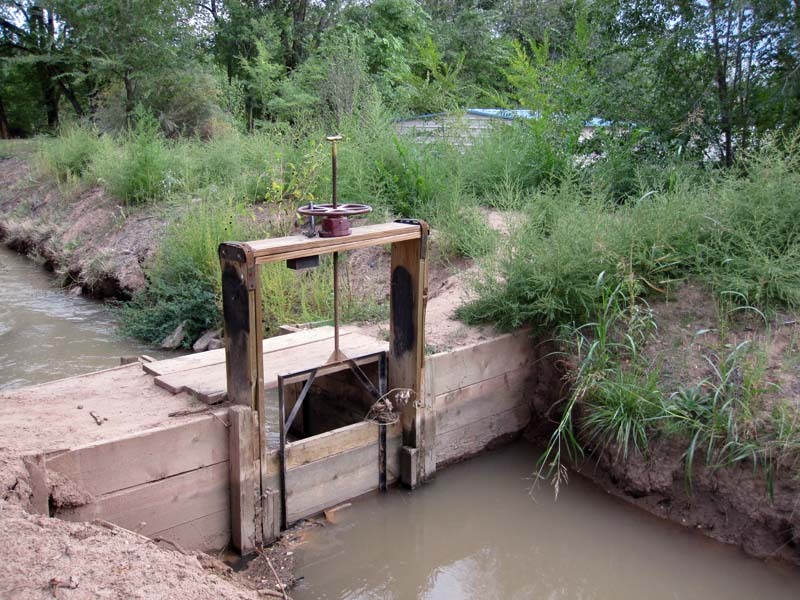 The canals branch off of the Rio Grande, and you make a request to the "canal boss" and he can bring more water down the canal and divert it to flood your property through these old gates you see below. A picture of the gate that can irrigate John and Nadine's property from the Acequias canal, you can see their house in the background.